Although not a launch title, Pat Riley Basketball does hold the distinction of being the first hoops game on the Genesis. As was the case with other early Sega sports games, PRB has no license and used the notoriety of one name to help sell cartridges. The game features 2 modes, a single exhibition game and a full tournament, and fictional teams from 8 NBA cities. Like most older basketball titles, the game scrolls from side to side mimicking a television broadcast. 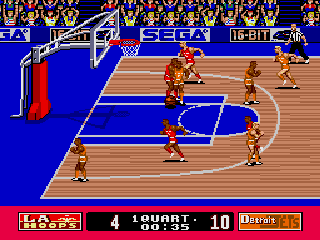 The graphics during normal game play are reasonably detailed, but the animations used for shots and during the tip-off feature humongous player models that are highly detailed. The controls are standard for a basketball game, with one quirk. You have to press B twice to shoot the ball. Pressing it once causes your player to jump into the air, but you get locked out of pressing it again after a certain amount of time, so that you’ll just land on the ground and get called for traveling. Also, if you’re close enough to the basket for a lay-up or a dunk, pressing B once initiates the animation sequence, during which you must press the button again based on proper timing using an on-screen meter, so you have to learn when to double-tap B and when not to. Different players move at different speeds, and some of the slower guys are painfully so, but overall the game moves at a good pace and the difference among the players offers up a bit of variety. An options menu allows you to set the length of quarters and the game speed as well as turning off the background music, cycle through the music and sound effects, and most awesomely, cycle through all of the game’s animations. Pat Riley Basketball seems to get universally panned by critics, but I don’t think it’s bad at all. In fact, I had a good time playing it for this review. Sure, it doesn’t stand up to later basketball games on the Genesis, but at the time of its release, I think it was a superior alternative to similar 8-bit games. Buy Pat Riley Basketball on GameGavel or Amazon. Tagged Basketball, genesis, Pat Riley Basketball, Review, sega, Sports. Bookmark the permalink.